Simple features make merging data with geospatial objects a lot less complicated. And, don't miss the last step: A tiny code snippet changes a static map to an interactive one. The non-spatial data -- things like unemployment rates that you might want to map by county -- resided in special @data slots, which were unfamiliar to many R users. Slots weren't that tough to deal with, but they were Yet Another Thing To Learn. Thanks to the Simple Features for R project, though, it's possible to represent geospatial data in what looks very much like a conventional data frame. The more human-readable structure of a simple features R object. 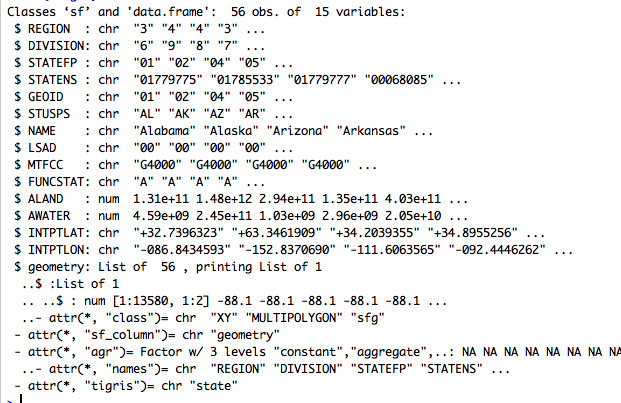 The data is now in what appears to be a "regular" R data frame; the geospatial data is tucked into a special list column containing geographies. This makes it easy to merge data sets like employment or median wages with a shapefile containing geographies. I'll show you one way to do this using R simple features, creating a map of median wages for IT managers by state. As is appropriate for pretty much any real-world analysis and visualization, most of the project involves acquiring and cleaning the data. Once the data is in the right format, mapping itself will be a breeze. If you want to skip to the mapping section, head straight to step 4. The easiest way to do this is Kyle E. Walker's tigris package. For this project, you'll need the development version of tigris from GitHub, not the older version available on CRAN, because the CRAN version doesn't yet support simple features. If you've already got the devtools R package on your system, you can install newer tigris with devtools::install_github('walkerke/tigris'). If you don't have devtools, you can either install devtools first, or a lighter-weight GitHub-installation package called remotes. I suggest opting for remotes; you can install that on your system with install.packages("remotes"). 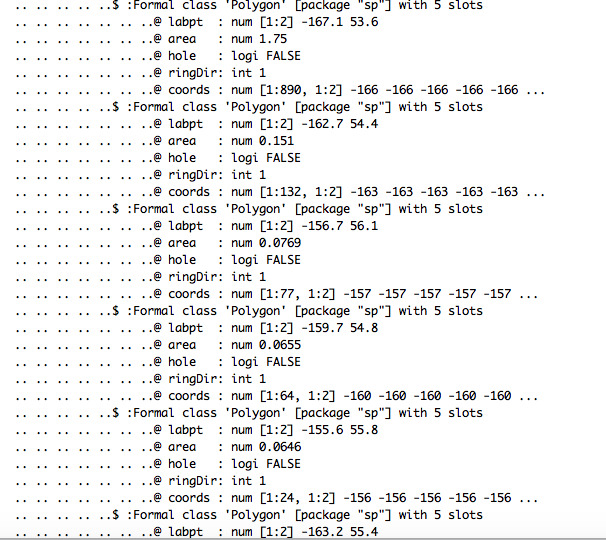 Next, install tigris with remotes::install_github('walkerke/tigris') and load it with library("tigris"). Note that states() without class = "sf" will return a Spatial Polygons Data Frame and not a simple features object. There's more information about the tigris package's capabilities at the tigris GitHub website. If you have problems with this, as I occasionally had due to issues with the Census Bureau's API this week, you can download a shape file manually from the bureau's TIGER Cartographic Boundary Shapefiles site here: https://www.census.gov/geo/maps-data/data/cbf/cbf_state.html. Choose the cb_2015_us_state_20m.zip file, download and unzip it. (Assuming the file downloaded into your working directory. If not, make sure to include the full path to your zip file ). 2. Import the data you want to map. I went to the U.S. Bureau of Labor Statistics Occupational Employment Statistics query page, chose "One occupation for multiple geographical areas," and then picked "Computer and Information Systems Managers" by geographic type State, "All states in this list," "Annual median wage" as the data type, and Excel as the output. If you open the file, you'll see there are 3 rows of meta data at the top (R will count merged rows 2, 3 and 4 as a single row) and 4 rows at the bottom. I moved the footnotes to a separate tab and skipped the first 3 rows when importing (there's no easy way to skip rows at the end). I like the rio package for reading in data. If you don't have it, you can install it with install.packages("rio"). Unfortunately, state names in this data look like "Alabama(0100000)" instead of "Alabama." Now, data in the wages State column in wages matches state names in the us_geo NAME column. The id = "NAME" portion isn't actually necessary for this map, but it's useful for the next step. For this map, it's a little tough to see the contiguous 48 states because the map is zoomed out to include all of Alaska and Hawaii. Static map with all 50 states is a bit difficult to view. Static map of median U.S. wages for computer and IS managers created with the R tmap package. For presentation purposes, there's an excellent tmap tutorial on creating insets for Alaska and Hawaii. 5. Create an interactive map with two simple lines of code. Then, to re-draw the last map, run last_map(). That's it! You should have a zoomable interactive map, where clicking on a state gives data details. Interactive map created with tmap and leaflet R packages. For more on tmap, check out the tmap in a nutshell vignette. For leaflet capabilities, see the leaflet package website.